Apparently, sometime in a past life, I went through a shrimp pasta phase. All I cooked was pasta. All I added was shrimp. And whatever vegetables I had on hand. And cheese. I vaguely remember making pasta with shrimp a couple of times in the past. Murdo insists that I made it so much, he got shrimped out. So shrimped out that when I was frantically searching my recipe books and websites last weekend (I was determined to cook something blog-worthy for dinner that night) and casually mentioned shrimp pasta, he groaned. "Awww I knew you were gonna say that." I guess shrimp pasta is my go-to dish when I'm stumped for ideas. Who knew? So I didn't make it that night. I made menudo, instead. But the shrimp pasta was still in the back of my mind. I had all of the ingredients for a perfectly light, easy, and delicious pasta, and they were just aching to be used before they wilted and rotted away in my fridge. 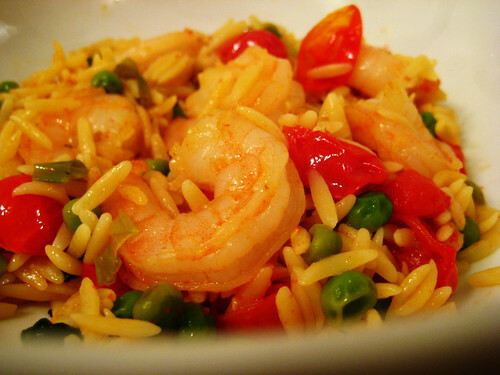 So the next night I made orzo with shrimp, grape tomatoes, spinach, and green peas. Topped with shredded Parmesan cheese. Murdo had gyros from Nicky's. 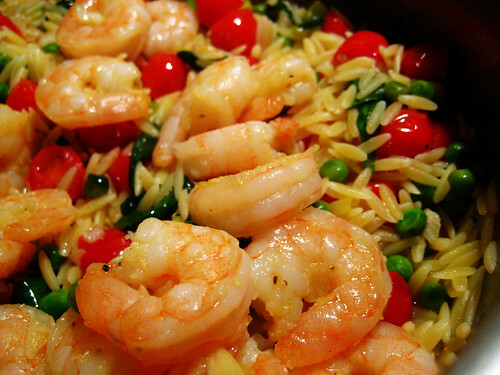 In the time it took to boil water and cook the orzo, the shrimp and the veggies were ready. I ate the leftovers for lunch a couple of days later, and even tossed a couple of spoonfuls with some fresh baby spinach the next night for a late-night salad. I don't think I could ever get shrimped out. Looks great--I don't think I could ever get shrimped out, either! So colorful and appetizing! I've got 3 bags of frozen shrimp in my freezer so you're not alone in your shrimp dependency. That's hilarious about the shrimp phase, especially that you didn't realize it. I think when we really love something, we don't mind eating it over and over (and over) again! meg - thank you! glad you could stop by. tangled noodle - yikes i just finished off my last bag of shrimp! it's on my list for the next grocery trip.